Crystal Skye is the largest privately owned tour jet in the world and is deployed for chartered service, accommodating some of the world’s most discriminating groups and travellers. 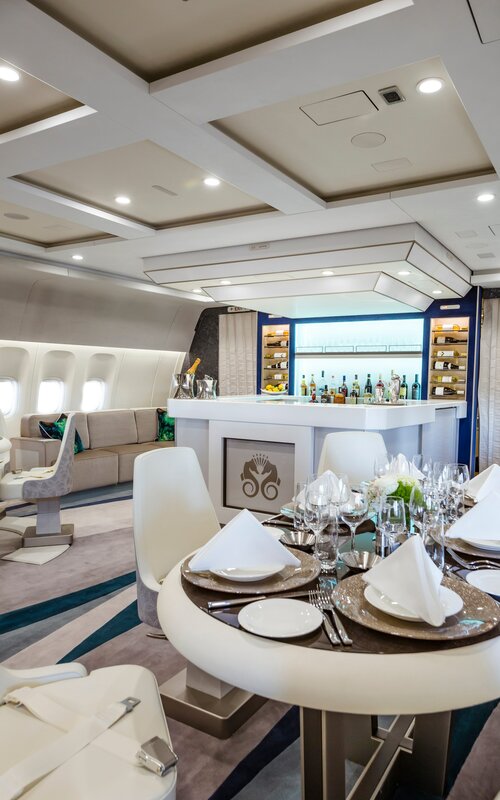 The exquisitely outfitted Boeing 777-200LR was delivered to Crystal’s CEO and president, Edie Rodriguez from Greenpoint Technologies. “We are ecstatic to welcome Crystal Skye to the family, as she marks the beginning of a new chapter and realm of luxury travel for guests who seek the unmatched Crystal Experience,” says Rodriguez. The jet has a spacious design for up to 88 guests; it features that are rarely found in even the most luxurious private jets. According to Crystal AirCruises, the jet has the highest crew to passenger ratio of any twin-aisle aircraft and a non-stop range of 19.5 hours, allowing travelers to explore the far reaches of the earth while enjoying the personalized service. Bespoke Crystal Exclusive Class seats are designed for maximum personal space and ergonomic comfort, and convert to 180-degree lie-flat beds. The expansive social lounge with stand-up bar fosters friendly camaraderie among luxury travelers. Cuisine is prepared by an executive chef, in two state-of-the-art galleys and paired with an elegant premium wine list from the Crystal SkyeCellar. Crystal collaborated with Greenpoint Technologies for the development of Crystal Skye. Setting the record straight, it is worthy to note that the interior installation of Crystal Skye began in August 2016 at Greenpoint’s Moses Lake facility in Washington, focusing on exclusive features such as a 24-seat lounge with a central bar, sofas, custom coved ceilings, the largest wine cellar in the sky and ample space to socialize. Stone veneers, colored LED lighting and other premium details adorn the extraordinary interior. Bret Neely, Executive Vice President at Greenpoint Technologies said their goal for the jet program was to create a luxurious interior showcasing the elegant brand Crystal has established with their cruise ships, yachts, and riverboats. “Greenpoint is a company built on Teamwork. Both internally and externally with our customers. It was amazing to see the combined core team come together to focus on Crystal’s guest experience, resulting in the beautiful and functional interior we see today,” Neely said. Boeing 777 Crystal Skye is operated for Crystal AirCruises by Comlux Aruba NV.